Chicago is a great city for a bowling match: from classic, hand set lanes with pinsetters of a bygone era to sleek, modern bowling lounges, there&apos;s a bowling alley to match every whim. Here are our picks for Chicago top bowling alleys. Located adjacent to the House of Blues in downtown landmark Marina City, 10pin offers a high energy, upscale bowling experience. Four state-of-the-art lanes are topped by 8 high-definition video screens, while a nightclub quality audio system will keep you on your dancing feet. Enjoy the extensive martini list and a wide selection of tasty small plates, served lane-side. At Southport Lanes, one of Chicago&apos;s oldest bowling spots, it&apos;s urgent that you follow the well-posted rule: Don&apos;t bowl if you see legs. That&apos;s because the pins are still reset and cleared by pinspotters behind the scenes. Even your bowling ball will be caught and rolled back down to you thanks to the the unseen "pinboys", who you can tip by sticking a dollar bill in your bowling ball&apos;s finger hole and sending it down the gutter. Just remember: green light = go for a strike. Legs = don&apos;t bowl. With over 32 craft beers on tap, lucky strikes are not uncommon. The original mural above the ten pins, with its lovely ladies dancing and frolicking around a globe might subliminally persuade you to go with a the Schlitz Gusto Classic lager, however. Bowling is slow, easy and hand scored. You can also opt to play candlepin, a variation of bowling popular in New England that calls for smaller balls and thinner pins. Both games are charged by the minute, but be forewarned that the excellent beer selection, hearty pub grub and retro bowling experience tend to turn minutes into hours. Located in downtown Streeterville, Pinstripes is an enormous upscale-casual dining and entertainment emporium featuring a year-round outdoor patio and fire pit, seven bocce courts, live music,a bistro with exceptional Italian-American cuisine and... a whopping eleven lanes of bowling bowling. Get the bowling party started by visiting during Pinstripes happy hour (M-F, 3-6:30pm), when a glass of house wine or a beer on tap will cost you just $4. 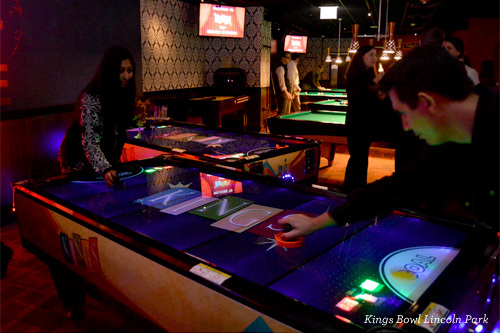 Chicago&apos;s newest bowling alley, Kings Bowl, is located in NewCity — the Lincoln Park neighborhood&apos;s latest entertainment complex. Sixteen ten-pin bowling lanes, a full-service restaurant, over 50 HDTV&apos;s and HD projector screens for all the sports action, 4 billiards tables, full-size and bank shuffleboard tables, 2 and 4-player air hockey tables and a foosball table make this a place to burn off some steam and have a blast with family and friends. Call ahead or visit their website to make an "Eat Then Bowl" dinner reservation: If everyone in your party orders an entrée or equivalent, your party will be moved to the top of the bowling wait list. On Monday thru Thursday, 3 p.m.-6 p.m., guests can enjoy half-priced appetizers and pizzas. Waveland Bowl is the largest bowling alley in Chicago with 40 lanes, all with automatic scoring. This is a great alley for the kids, thanks to programmable bumpers available on every lane. Two bars, a billiards area, a children&apos;s movie theater and a alley-fare restaurant round out the fun. Call ahead and try to arrange a visit when Cosmic Bowl descends upon the alley: Eight times each week, the house lights go dark and the black lights glow, fog machines get to work and the music starts while multitude of magnificent dancing lights and color fill the center making for a truly out-of-this world bowling experience.